Reporters at Vermont Gov. 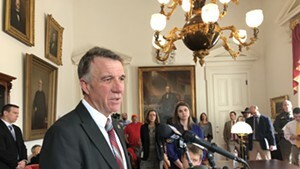 Phil Scott's press conference Thursday might as well have been tossing pebbles at a brick wall. 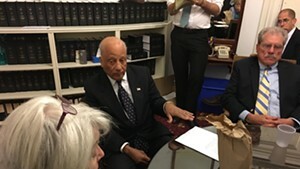 The governor was immovable in the face of tough questioning about his school funding plan, the cold shoulder it's received from the legislature and the apparent mistakes in the plan's numbers. He called for consensus and "coming to the table," but he insisted that any compromise would have to be "within the plan." He asserted that the legislature is on track to raise taxes by as much as $83 million, including a projected $58 million increase in property taxes. "This approach is not acceptable to me," he said. The legislature, in truth, is doing nothing to enact the property tax increase. That was the result of voters approving more than 95 percent of school budgets on Town Meeting Day. Those votes determined the property tax rate, which by law must be set to provide enough money for all those local budgets. 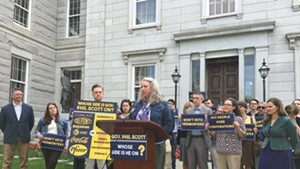 Scott dismissed the overwhelming approval of school budgets, arguing that people don't realize the property tax consequences of their votes. "I don’t believe voters went into the booth and considered that their property taxes were going to increase next year and voted for their budgets," he said. "I just don’t believe that." When pressed on whether voters might realize that approving higher budgets would mean higher taxes, he stuck to his guns. "I just don’t think that people do that kind of math," he said. This, despite the fact that state law requires school ballots to clearly indicate the full dollar amount of the budget, the per-pupil amount, whether the budget is higher or lower than the previous year's and by what percentage. Voters actually have quite a bit of information. 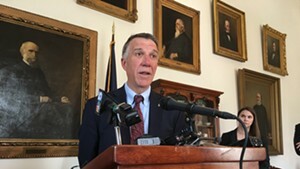 Scott talked of a mutual effort with the legislature. "There’s so much that we could do if we could work together and look at what we’ve already passed, each body has already passed in some respects, and fold it into one plan," he said. 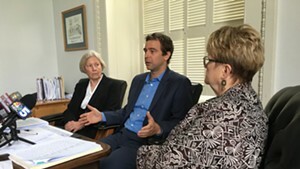 But even as he acknowledged the legislature's progress on key cost-control initiatives, he defended administration officials such as chief of staff Jason Gibbs, who have claimed that the legislature has "effectively ignored" money-saving ideas until very recently. "They haven’t passed anything," Scott said. When reminded that lawmakers have been working steadily through the session on cost-saving plans, he replied, "But what have they passed? ... I’m sure they’ve been working on something, but they haven’t passed anything." His professed ignorance of the legislature's work seems a bit disingenuous. There appear to be no active negotiations between the Scott administration and the legislature. That's not surprising, given the fact that the governor is not ceding any ground. "We need the whole plan together," he said. "We need all the provisions within the plan." 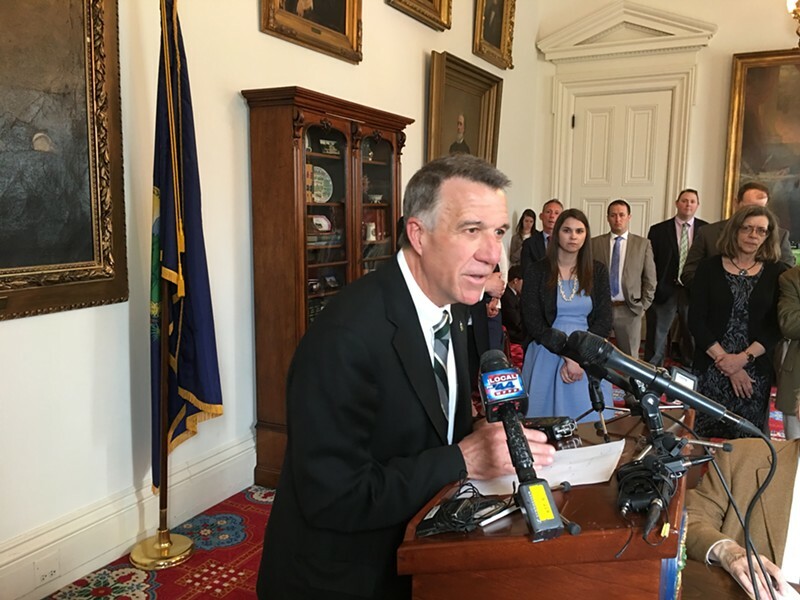 Scott is insisting the plan must include $58 million in one-time money to keep property tax rates level, no rate hikes for the next five years and a set of proposals designed to pare back school spending over that time. "Within the plan," he said. "They may want to go more years. They might want to go fewer years. There’s areas that we can compromise within that plan." The operative words being "within the plan." Lawmakers are moving toward adjournment as soon as Saturday. Scott is unbending. A cynical mind might conclude that he'd prefer a standoff to a resolution.